Would you like a warm drink that is soothing, comforting, spicy, and provides your body with many health benefits? I’m about to tell you all about the drink you need to have in your life, and maybe even replace coffee with. Chai tea is a drink with wonderful properties that dates back thousands of years. Only recently it has become mainstream in the west, and we are all loving it. Maybe you have seen fancy new drinks like chai lattes & chai frappuccino at Starbucks and grocery stores. If you’re curious to know what all the chai tea craze is about, keep reading. First, let’s get something out of the way: these commercial beverages are nowhere near close to the original chai. 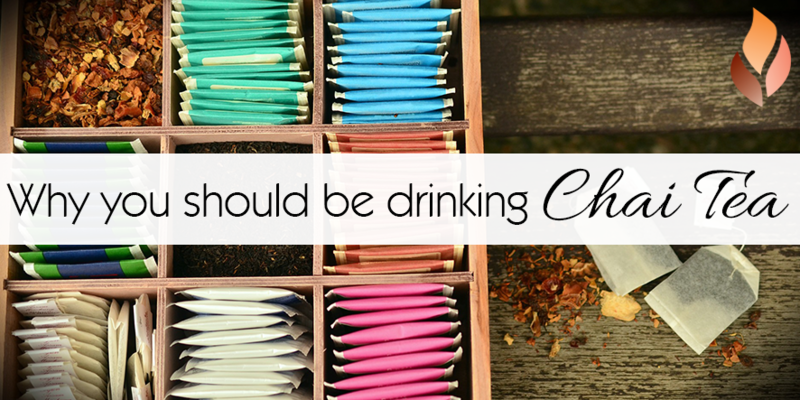 I’m going to let you know all about why you should be drinking authentic chai tea. Where Does Chai Come From? This comforting and soothing beverage date back 5000 years to India and Siam. It was widely used as a remedy in Ayurveda – a system of preventive medicine created in India more than 5000 years ago – as a healing beverage to treat many digestive ailments. Its popularity grew so much throughout South Asia that nowadays it is one of the most common beverages in the region. It was brought to the West by the British Empire during colonial times thanks to the trade between the Indians and the British. Apart from its healing properties, it was also consumed for its calming effects. If you’ve ever drunk real chai, you know how soothing and warm it feels. I began drinking chai tea several months ago in the mornings, and it feels so much better to start my day with such a delicious and calming drink. Maybe you should too. Now let’s take a closer look at what makes chai so especial. Chai tea is a blend of black tea, spices, and milk that create a flavorful drink packed with many health benefits. Since chai is so popular in India and South Asia, different regions have their own way of preparing chai. If you went to India, you would realize different shops prepare a different version of the tea. Black tea is made with the leaves of the plant Camellia Sinensis, the same plant that gives us green, white, and oolong tea. It’s packed with powerful antioxidants and contains lower levels of caffeine than coffee. Black tea is the strong base of chai. No wonder it’s such a healthy drink! The most known benefit of black tea is its antioxidant power. Because it fights free radicals and gets rid of heavy metals in the body, it’s anti-inflammatory and protective against cancer, DNA damage, and mutagenesis. It also suppresses the synthesis of an enzyme that could cause cancer (fatty acid synthase). It has cardioprotective properties. It prevents the oxidation of “bad” cholesterol (LDL), lowering the risk of heart disease. It protects your digestive system by improving the absorption of nutrients, increasing intestinal motility, and balancing the microflora in your gut. It improves bone mineral density, which protects against osteoporosis. It decreases the risk of rheumatoid arthritis, according to the Iowa Women’s Health Study. In the study, the researchers compared the effects of coffee and tea in rheumatoid arthritis. While coffee increases the risk of arthritis, tea lowers it. From the study: “Decaffeinated coffee intake is independently and positively associated with rheumatoid arthritis onset while tea consumption shows an inverse association with disease onset”. One more reason to switch to tea! It reduces the risk of type 2 diabetes. Ginger is a root packed with many immune and digestive benefits. It has a peppery and spicy taste. It’s also been used for centuries as a remedy and as a spice. Ginger is packed with potent antioxidant properties. According to this study, it’s the root that contains the highest antioxidant compounds, even more than beets, turnip, and carrots. It’s only surpassed by certain types of berries and pomegranate. That’s an impressive level of antioxidants! Due to its antioxidant properties, it has been proven to inhibit oxidative damage, inflammation, nausea, cancer, asthma, dementia, colitis, cardiovascular disease, platelet aggregation and harmful cholesterol. It reduces inflammation, swelling, and pain. This is particularly helpful to people with arthritis and women with painful menstruation. A double-blind comparative clinical trial showed that ginger was more effective than common painkillers in relieving pain in women with menstrual cramps. From the study: “Ginger (250-mg capsules) was as effective as the nonsteroidal anti-inflammatory drugs mefenamic acid (250 mg) and ibuprofen (400 mg) in relieving pain in women with primary dysmenorrhea.” This is great news if you experience painful periods and prefer not to take pain killers. It has anti-nausea properties. Ginger helps to dispel gas and accelerate gastric emptying to stop nausea and vomiting. It’s also widely used to treat seasickness, and it has been found more effective than medicine or placebo against motion sickness. Cinnamon is also full of antioxidants – not to mention it tastes amazing! It has unique compounds with anti-diabetic, antimicrobial, anticancer, antioxidant, and lipid lowering abilities. The best part is you don’t need much to enjoy all the benefits, a little goes a long way! It has antioxidant properties that inhibit fatty acid oxidation (a possible precursor of cancer) and lipid peroxidation (which causes heart disease). In this study, cinnamon showed the highest antioxidant activity of different dessert spices. It has anti-inflammatory effects. Several compounds in cinnamon have been isolated for research and scientists have discovered they have considerable anti-inflammatory effects in the body. It has neurological benefits, particularly in the prevention of Alzheimer’s and Parkinson’s disease. It helps to fight and prevent diabetes by lowering blood glucose and cholesterol levels. Cardamom is another spice that has been widely in traditional medicine. Even though ginger is higher in antioxidants, this spice still has many important properties, such as cardiovascular, digestive, and anti-tumorigenic benefits. It lowers blood pressure. This study found that people with hypertension who ingested 3g of cardamom for 12 weeks had a significant decrease in systolic, diastolic and mean blood pressure. It prevents blood clots. The same study found that the natural process of the body that prevents the growth of blood clots (called fibrinolysis) was greatly enhanced at the end of the 12th week. It has antioxidant properties. Studies show that cardamom may be beneficial to treat and prevent skin cancer because it was able to reduce the size and number of skin papillom as generated on the test. It helps to treat constipation and diarrhea. A study found that cardamom was able to help stimulate the gut (in the case of constipation) and also to inhibit digestion (in the case of diarrhea). This means it will contribute to balancing your gut and fight digestive issues. Clove is another powerful spice full of medicinal properties that have been around for centuries. It has antimicrobial, antioxidant, analgesic, anticancer, and antiviral effects. It has antibacterial and anti-fungal properties. A study measured the bactericidal effects against food borne pathogens of several spices including mint, cinnamon, and mustard, and found that only clove extract showed a complete bactericidal effect. It has antiviral properties. Clove was shown to have strong antiviral activity against herpes simplex. It’s an analgesic. Clove has a unique compound called eugenol, which is responsible for reducing pain in cases like a toothache, joint pain, and spasms. It may prevent cancer. This study tested different spice extracts against different cancer cell lines including cervical, breast, prostate, and esophageal cancer. Clover extract was the most effective against all cancer types. Black pepper has a powerful compound called piperine, which is responsible for many of its health benefits, including blood pressure reduction, antioxidant effects, and digestive properties. It improves digestion. By stimulating the digestive enzymes of the pancreas, it improves digestive capacity and reduces the food transit time, which promotes a fast elimination of waste. It enhances the absorption of plant compounds. Piperine enhances the bio-availability of phytochemicals, as well of therapeutic drugs. It helps to reduce hypertension. Studies have shown piperine actually lowers blood pressure. It has antioxidant activity. This review explains that piperine positively affects antioxidant molecules and anti-oxidant enzymes. Star anise is highly antimicrobial. It possesses a compound called anethole that is responsible for many of its benefits. Adding star anise to your chai will boost its antimicrobial power, which can be helpful if you’re sick. It fights bacteria and yeast strains. In combination with other antimicrobial compounds found in plants, it’s able to improve significantly its own antibacterial effects. That’s why adding it to your chai is such a good idea! The antimicrobial compounds in the other ingredients, like ginger, will help star anise to work in synergy. It’s anti-inflammatory. A study showed that anethole was able to reduce greatly the inflammation of acute lung injury. It’s anti-fungal. Star anise extract was able to reduce the growth of a common yeast strain, Candida Albicans. This type of yeast occurs naturally in several parts of the body, but it can grow to a dangerous extent and cause infections when your body is sick or if there’s an imbalance of microbes. Nutmeg is partly responsible for the feel-good effect of chai. Besides giving it a delicious flavor, it intervenes with some of the hormones in charge your mood. It has an antidepressant effect. A study showed that nutmeg extract has an antidepressant-like effect in mice by interacting with the systems that regulate dopamine and serotonin (your feel good hormones). It can reduce pain. This randomized, double-blind, placebo-controlled trial (one of the most reliable types of studies) showed that nutmeg severely reduced neuropathic pain in diabetics. It has anti-inflammatory properties. This study showed that nutmeg reduced the growth of tumors in the intestine by attacking inflammatory substances. Fennel is a highly beneficial plant with digestive, anti- inflammatory, anti-carcinogenic and antioxidant activity. It reduces tumor growth. This study showed that fennel extract has anti-tumor effects because it increases the antioxidant defense system of the body. It reduces menstrual cramps. In this study, 52% of the girls tested experienced a significant reduction in pain from menstrual cramps after 3 days of taking fennel extract. Relieves bloating and improves digestion. Fennel is able to reduce colic, pain and gas that cause digestive problems. Fenchone, a unique compound in fennel, relaxes the smooth muscle lining of the digestive tract, which helps to regulate digestion and cure ailments. Now that you know this, it’s an understatement to say you need to be drinking chai often, if not everyday! 1. Anti-inflammatory benefits: Black tea, ginger, and cinnamon have powerful anti-inflammatory benefits that help relieve pain and dysmenorrhea and prevent tumor growth. 2. Antioxidant Benefits: Virtually all the ingredients in chai tea are packed with antioxidants that protect your body against free radical damage that leads to cancer and early aging. 3. Cardiovascular benefits: Black tea, cardamom, and pepper have cardio- protective properties that will keep your cardiovascular system healthy. 4. Calming effects: The warmth and earthy flavor of chai are soothing, and the nutmeg in it has an antidepressant effect on your brain. 5. It reduces your caffeine intake: If you drink chai tea instead of coffee, you’re not only gaining incredible health benefits, you would also reduce your caffeine intake. According to the Mayo Clinic, a cup of black coffee has 95-200 mg of caffeine, while black tea only has 14-70 mg. That’s less than triple the caffeine. Since you shouldn’t consume more than 500 mg of caffeine a day, the switch would allow you to drink more tea without surpassing your daily intake of caffeine. 6. Improves digestion: Fennel, ginger, and cardamom help to regulate digestion and prevent bloating, nausea, and vomiting.